At the start of this year, I set some "New DIYear" resolutions for myself outlining the big home projects I wanted to accomplish this year. Well as New Year's resolutions often go, I've had a slow start with most of these resolutions. But, I am VERY happy to announce the major progress we've made with one of the resolutions...a new fireplace mantle! Not only was this mantle not very attractive, but it wasn't very practical either. The mantle shelf was only about 2 inches deep so nothing could be placed on it. We also needed a deeper mantle to protect our obnoxiously large TV from getting too hot when the fire was on and to hide its various electronic wires. However, we weren't looking to spend a lot of money on the mantle since we know this isn't our "forever" home. Luckily, I have a very handy Dad that built us a new fireplace mantle shelf! My Dad cut and stained two pieces of oak to serve as a wider and deeper shelf on top of the existing mantle. Between each of the oak pieces, he added decorative rope molding. Total cost was about $40! I'm not quite done with the fireplace yet though. I'd like to paint the horrible brassy gold vents with black high-temperature spray paint. I am also considering tiling over the black surround with mosaic tiles. Painting the entire mantle white has also crossed my mind. What do you think, should I leave the mantle oak colored (which matches the cabinets in my adjacent kitchen) or should I paint the mantle white? Any suggestions for what I should place on top of the mantle? This project is shared on Beneath My Heart, Blue Cricket Design, We Are That Family, A Soft Place, and The Nester, stop by and check out some of the other great projects featured! Last weekend, my sister called me and asked if I wanted to borrow the lawn dethatcher she rented. When I had no idea what she was talking about, I quickly realized I don't know squat about lawn care. Seriously, how does everyone else know when and what to do to their lawn? I must have missed that pamphlet and reliable information about lawn care is surprisingly hard to find online. 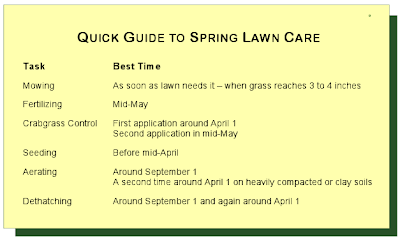 But I did some research, and came across some Spring lawn care tips. First, apparently lawn dethatching is the process of ripping up any decomposing grass, dead roots, and other junk that has accumulated in your grass. If you have too much of this thatch (or lawn junk as I call it), necessary water and nutrients won't reach your soil. Dethatching should be done around the start of April and September. We borrowed the dethatcher machine not really knowing why it should be done (hey, it was free what more do I need to know), but it turns out the machine dug up a lot of our old lawn junk and made our grass look much fresher! Mow your grass as soon as it needs it, don't wait. If you allow the grass to get too tall, you risk encouraging diseases. Wait until mid or late Spring before fertilizing your lawn. Fertilizing your lawn too early, like in March, can make your grass look green, but in the long run it can damage the root growth and your grass will suffer in the hot days of summer. Crabgrass begins stirring up once the soil temperature has been over 55 degrees for 7-10 consecutive days, so early Spring is a good time to apply crabgrass pre-emergence treatments. Generally, one treatment should be give around the start of April with another treatment around Mother's Day. When applying crabgrass treatment, make sure to only apply it to the parts of your grass that need it, don't apply to healthy grass. If you're adding grass seed, do it already! After April seeding can be hit or miss, so add grass seed by mid-April. Once seed is added, make sure it has good contact with the soil and don't allow it to dry out even if this means watering once or twice a day. If you're adding fresh sod, it can be added anytime the ground isn't frozen. Just make sure to water frequently until the roots are established. Avoid heavy activity on fresh sod but don't be afraid to mow it, mow as needed. Aeration is the process of increasing the soil's air content. This should be done in the Fall and again at the start of April if needed. Minimally, aeration should be done once every 3-5 years, but doing it yearly is recommended. Aeration is typically done with big spikey thing you push that pokes air holes into your lawn, a smaller spikey thing you roll, or a spikey rake (those are the scientific explanations), but I've also seen spikes that you slip onto your shoes for sale. I haven't tried any of these methods, so I can't attest for how well they'll work. Has anyone tried these types of products? Are there any other lawn care tips I should know? I'd also like to research some natural lawn care methods, as opposed to all of the chemical treatments that are sold. Do you have any diy tips to share? So I haven’t done well keeping up with my weekend photo snapshot posts, or posting at all recently, but with this weekend’s beautiful springtime weather I had no excuse not to get outside and work on my photography. The Northeast has experienced uncharacteristically warm Spring-like weather the past week and I spent some wonderful time playing with my puppy outdoors. Okay, so truthfully this post is more about posting shameless photos of my adorable puppy rather than working on my photography skills. But hey, it’s my blog so if I want to be biased and post the cutest puppy photos ever taken, I will! 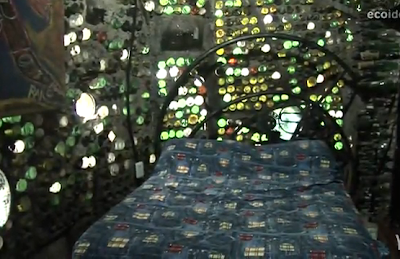 Talk about being resourceful, a man in Argentina has built a house for himself using 6 MILLION recycled glass bottles. 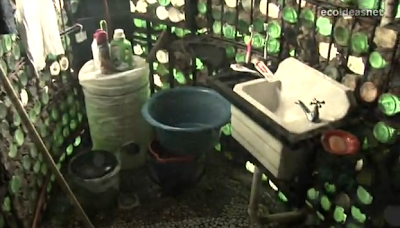 For the past 19 years, Tito Ingenieri has been adding to his house and building it from glass bottles he’s collected in his town. He has been able to take what some consider trash and create a home for himself, saying it’s the only way he was able to build his own house. While we obviously all aren’t going to start building our house from bottles, I think this is a very inspiring story showing how a man was able to build a home using the resources he had available for himself. This story also inspires me to think about other uses for all of the glass and plastic bottles I put in the recycling each week. I try to re-use food bottles and containers for storing leftovers and other things as much as possible, but most of it still goes into the recycling. 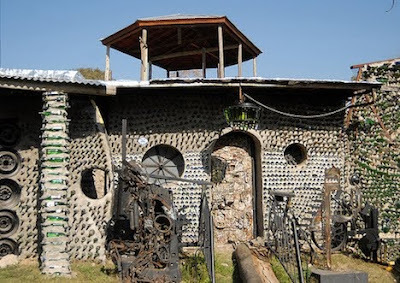 Of course recycling is better than trashing the items, but if this man can build a house from bottles, surely there are ways I can re-use all of the soda bottles, pasta sauce jars, milk bottles, yogurt containers, and all the other food containers we typically buy. Any suggestions? Watch more about this super cool house below or read about this glass house on Fast Company.